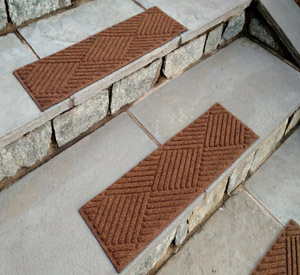 Diamond Pattern Waterhog Stair Treads scrape dirt, debris, snow, salts and water from shoes while boosting the slip-resistance on residential steps. These waterhog stair treads work great both indoors and out of the house. Waterhog Stair Treads are stain, fade and mildew resistant thanks to their heavy-duty, recycled polypropylene surface and their sturdy rubber backing. • Diamond shaped stair treads boast rubber-reinforced, crush-resistant nubs. • Protect your steps from the constant wear and tear damage due to gravel, debris, water and grime with Waterhog stair treads. • Each stair tread is approximately 8.5" x 30" - 2 stair treads per set. • A low-profile allows doors to easily swing over the tread without catching. • Made from fast-drying, easy-to-clean materials. Simply shake out or hose off. NOTE: The nitrile rubber underside keeps stair treads in place though Waterhog Stair Tread Tape is highly recommended. NOTE: These stair treads are intended for residential use. We want to earn your business. That is why we are committed to delivering mats at the lowest possible cost to our customers. If you happen to find a lower total cost (inclusive of shipping, fees, tax, etc.) Waterhog Floor Mats will give you 110% of the difference.